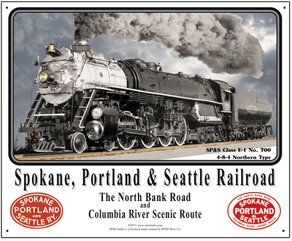 The Spokane Portland & Seattle Railroad is now part of the BNSF Railway system. Individual marks are licensed marks owned by BNSF Railway Company and are used under an active license agreement. 6 inch x 6 inch square tin logo sign of the Spokane Portland & Seattle Railroad. Powerful SP&S 4-8-4 Northern type steam locomotive in as new condition.